Fitting a body harness is the most efficient way to teach your dog to pull effectively – hence their use whenever good pulling performance is needed, i.e. sled dogs, dog carting, oxen pulling a plow etc. The only harness that can help with a pulling on the lead problem is a no-pull harness like the one marketed under the brand name Mikki Walkrite. This harness is designed especially to discourage pulling on the lead with the use of straps which pass behind your dogs front legs and up and over his back. These tighten when the dog pulls making pulling uncomfortable. The most efficient equipment to discourage pulling is the head collar. A head collar is like the halters worn by horses. 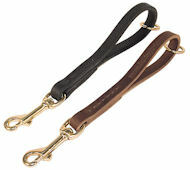 The head collar discourages pulling as the dog tends to follow where their head is going. The dog is also unable to put his full strength into the pull. The head collar takes a bit of getting used to (for you and the dog!) but once you have both got over the shock – they are great! With a head collar you do not need to rely on correction to keep your dog with you but on occasion, you will need some extra assistance to discourage pulling when your dog is really excited and intent on getting somewhere. You can either stand completely still or start walking backwards. Both will prevent your dog from getting were he had planned to go – which was forward. You might be wondering when, if ever, you will be able to take the head collar off and have your dog walk nicely on the lead? To prepare your dog for this stage, you need to start concentrating on keeping a loose loop of lead between you and your dog when he is in the heel position. 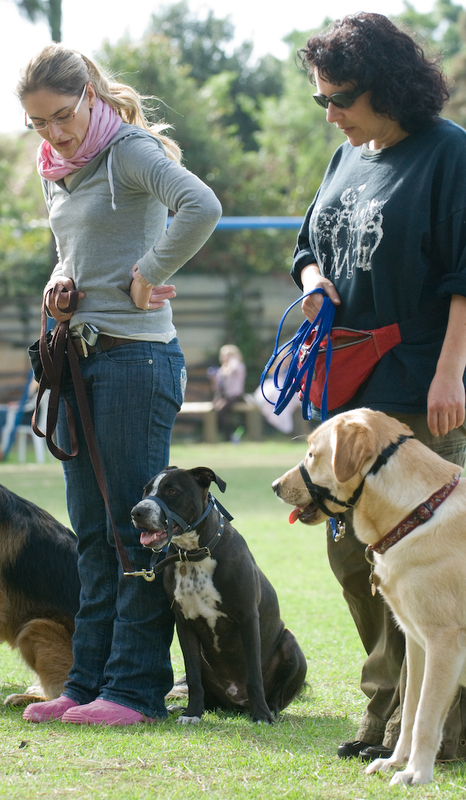 Use your voice before your lead to correct or assist your dog. Remember to reward your dog for being with you on a loose lead with treats, praise or a game with a toy. Many of us get into the habit of ignoring the dog when he is doing the right thing and notice him when he slips up and makes a mistake like pulling on he lead. It wont take your dog long to work out how to get your attention if you are ignoring loose lead walking! Once you can feel that your dog is not relying on the lead being tight to be with you, you can get yourself a toggle – a short handle of lead – to attach to the head collar. Fit a training collar to your dog with your lead attached. 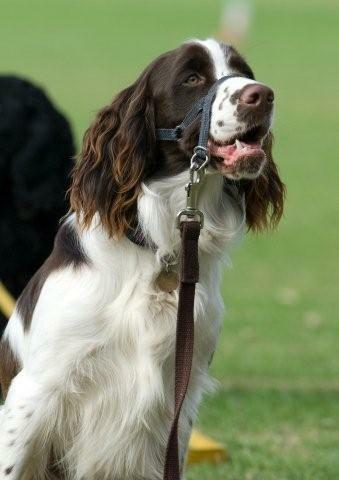 Start your training session with the toggle and head collar and as soon as you feel that your dog is ready, switch to using the regular collar and lead leaving the toggle to hang under your dogs chin – you can grab it if and when you need it and if your dog “loses it'” continue the session using the head collar. This process of alternating from collar to head collar while keeping the head collar on, is the ideal way to wean your dog off the head collar. Once you get to the point that you are never having to grab the toggle at all, you can remove the head collar completely. If your dog regresses when you do, go back to leaving the head collar on but not using it and try again at a later stage. Head Collars are available at our club in a range of sizes for only R50.00. « Do Dog Breeds Change? Yes you can order via email and I can post to you – otherwise you can purchase from the club in Pinelands. The size 4’s are in production at the moment. We should have stock again with a week. I will drop you a line when they arrive. Sorry about that. Yes we have stock of size 4’s. Please can you drop me a line info@capeprovincedogcub.co.za to give me your address? I have been using a Halti size 3 on my pitbull, but I need a new headcollar. Please could you let me know if you have any available at the moment and how and when I could arrange to purchase one. We have stock of size 3 at our club. You can collect from our club at Pinelands Primary School or we can post to you. Mail info@capeprovincedogclub.co.za to place an order. It would be best to go to a vet shop to get a good harness. Ask for a Mikki Walkrite. We keep halters at the club but not harnesses. You can purchase a harness from any vet shop. Please could I order a halter collar for my Dobe?Am I correct in reading that they are R50 (the halter collar) if not please could you advise price and cost to post to KZN. The halters are R100 each plus R50 postage. Can you mail me your address and I will send the bank details? I will send you an SMS. Our halters are R100 plus transport.Happy to help. who can I contact for carting lessons and also how to make the cart please.